So yesterday I was scouring YouTube for something to watch. I admit, boredom had sunk its jagged teeth into my cranium. You see the problem with religiously watching your favourite channels as soon as they post a video is that you end up having seen them all and as a result have nothing to watch. 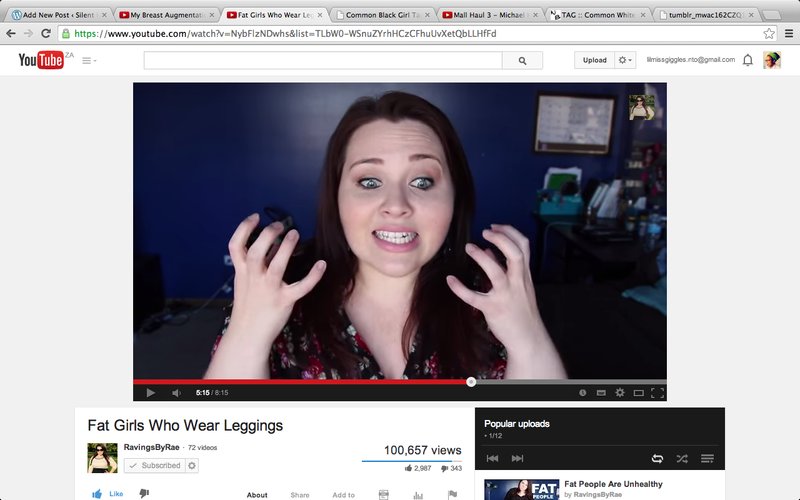 But after much milling about on YouTube, I found a video entitled ‘Fat Girls Who Wear Leggings‘ and my life changed. My life. Changed. This video made my day. I laughed, cried “I KNOW!” multiple times and laughed some more. In this video Sarah Rae Vargas speaks about the redundancy of proclaiming “Leggings aren’t pants!”, which, annoyingly, many people are prone do (I have a lot of personal experience with people like this). I loved every minute of it. She had a tasteful sarcastic approach to dealing with idiots trying to tell thicker people how to dress based on their body size. Argh. Such Magic. Sarah Rae Vargas has her own blog and YouTube channel. Her channel, RavingsByRae, comprises of vlogs dealing with other weight-related issues that her subscribers (ahem… me) might share, OOTDs, Product Reviews and Beauty Tutorials. My second favourite video of hers is her Plus Size Swimwear Lookbook. This video really reminded me of how awesome Forever 21 is and consequently made me extremely sad that we don’t have it here in South Africa. The swimsuits were all stunning. I mean, I want to buy each and every one of them. More importantly, she really rocked all the swimsuits, especially the bikinis! I myself have never had the confidence to rock a bikini but after watching RavingsByRae, I am definitely going to consider those high-waisted beauties! I know I probably have too many full swimming costumes but this one is just begging me to buy it! All in all, Sarah Rae Vergas is a phenomenal, confident and beautiful woman whose vlogs and blogs continue to inspire me and hopefully will inspire you! Sarah Rae vargas, you are to dead for,congrats to you and your gorgeous body.